If you've read my article on refretting, you know I never try to remove frets without heating them. Almost all the time, my modified soldering iron will heat a fret hot enough so I can pull it out with no chipping of the fingerboard. 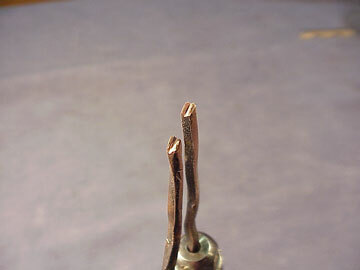 Sometimes, though, the fingerboard is super brittle or dry, or the frets are unusually barbed and tight. 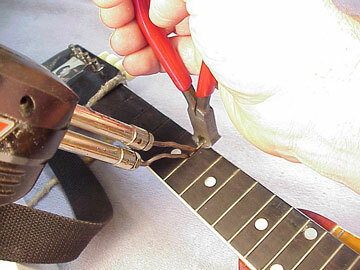 In those cases, my soldering iron just doesn't get the fret hot enough to allow it to sear its way out as I pull it. 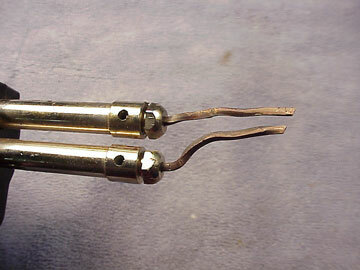 Here's a neat little modified tool that's guaranteed to get any fret really hot. In fact, it gets hot so fast it takes a bit of practice to control to avoid burning the fingerboard. The hot fret slips out of even the tightest slot, with little wisps of smoke wafting from the area. Try this one. It really works!